Pre-match warm-up. Summer is dead. Football has returned. With appetites whetted vehemently from a long pre-season, teams are slowly getting their leagues up and running. The start of most of the English Leagues last Saturday means that very few corners of the Pyramid are yet to kick a ball in anger. Predictably, the Isthmian League is one such corner, therefore, we’re forcing ourselves into one last preseason game before our lot resume normal service. Yesterday, I think it’s safe to say, was no normal day as Tooting and Mitcham lined up against an international powerhouse…Guyana, 114th in the FIFA rankings. How could I pass up this moment of excitement and sheer bemusement? International football. Live. In Morden. Of course club sides have been known to take on international teams on special occasions in the past. My Bradfordian co-Pigeon Stander remembers fondly the day he saw England play the Bantams at Valley Parade to commemorate the Bradford City Fire. Mercifully yesterday’s encounter was about something less horrific and the only thing on fire was Tooting & Mitcham striker Billy Dunn. 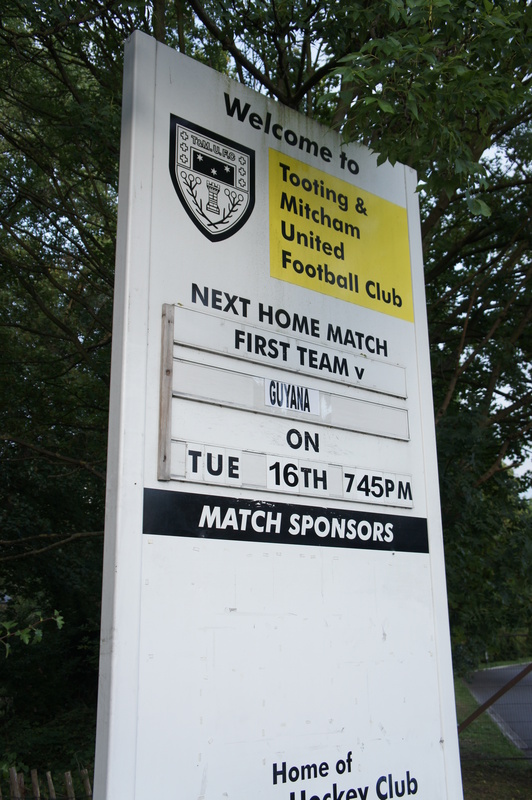 First off, I should explain that Tooting & Mitcham are the closest thing Dulwich Hamlet have to a rival. At a distance of over 6 miles, it’s not a rivalry born out of geography, it is a matter of history. Croydon Athletic, are a full mile closer to Champion Hill than Tooting but whilst there’s not much love lost, they are little more than a Bank Holiday fixture for Dulwich. In Tooting, Dulwich Hamlet have a snake to their mongoose. They are scum, sub-human scum. I had always vowed never to visit Imperial Fields unless on Hamlet duty, however the prospect of a ridiculous friendly and the thought that Dulwich may have to wait some time before lining up in deepest, darkest Morden meant that I left my prejudices at the turnstile and got psyched up for a festival of transcontinental football. Team Talk. 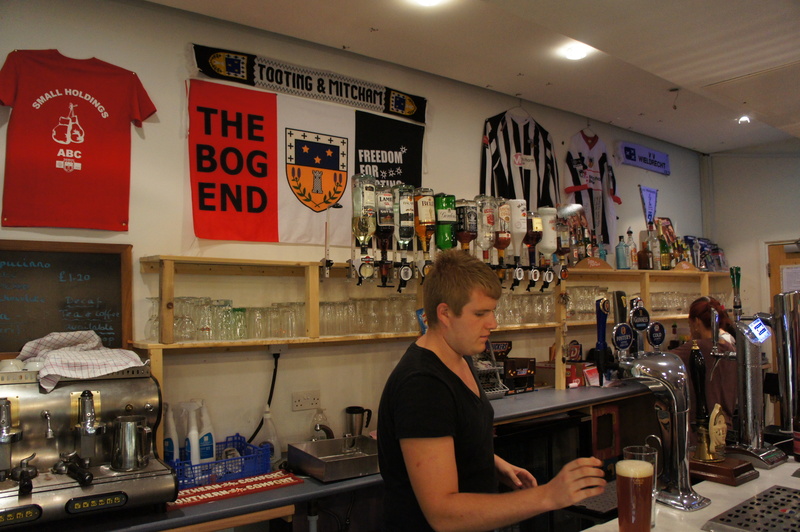 As you may have guessed by the name, Tooting and Mitcham United are the consequence of an interwar merger between Tooting Town and Mitcham Wanderers. Neither had a particularly decorated history and the unification – several years in the offing – was designed to yield success. Eventually, in 1958 the dream became a reality as The Terrors lifted their first Isthmian League title. This success was quickly followed by a tremendous run in the FA Cup resulting in a 3rd Round tie at home to Nottingham Forest. After a brave 2-2 draw, Forest won the replay and went on to win the cup. 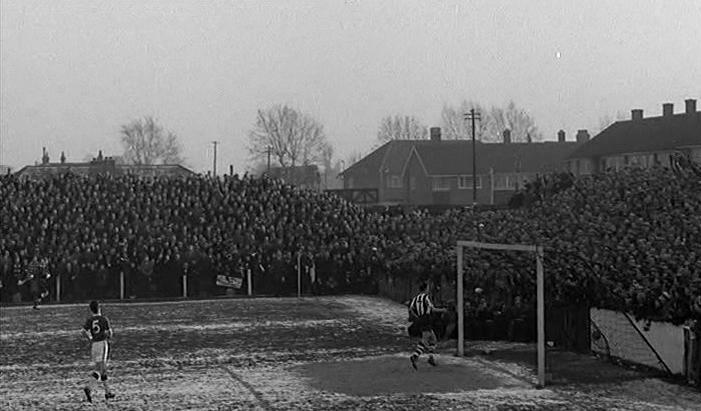 Most painfully for the elder generation of Hamlet supporters, Tooting’s success continued into the 1959/60 season as a crowd of nearly 17,000 watched Tooting and Mitcham beat Dulwich in the decider for the Isthmian league title. 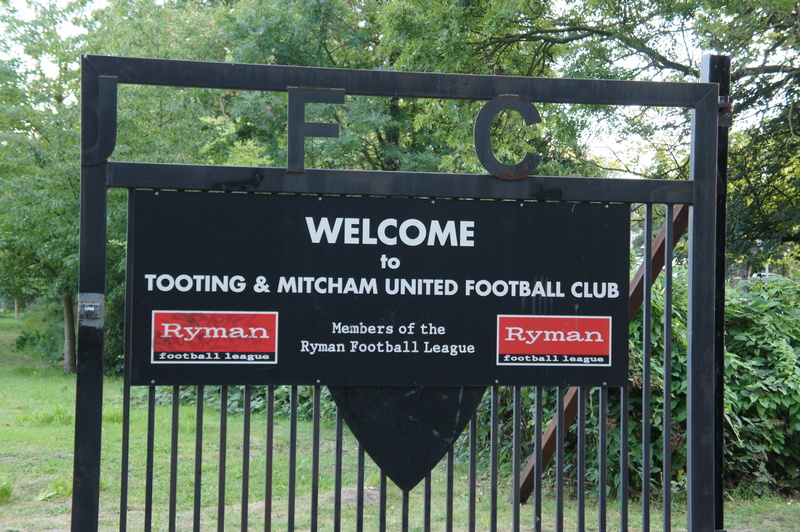 Tooting and Mitcham currently play in the Ryman’s Premier and their game with Guyana is the final warm-up before their campaign to avoid relegation begins on 20th August. Their opponents last night were Guyana’s Golden Jaguars (ranked between Wales and Guatemala) who had planned on this game being a warm-up for the UK-based members of the national side as they prepared for a 4 team mini-tournament. 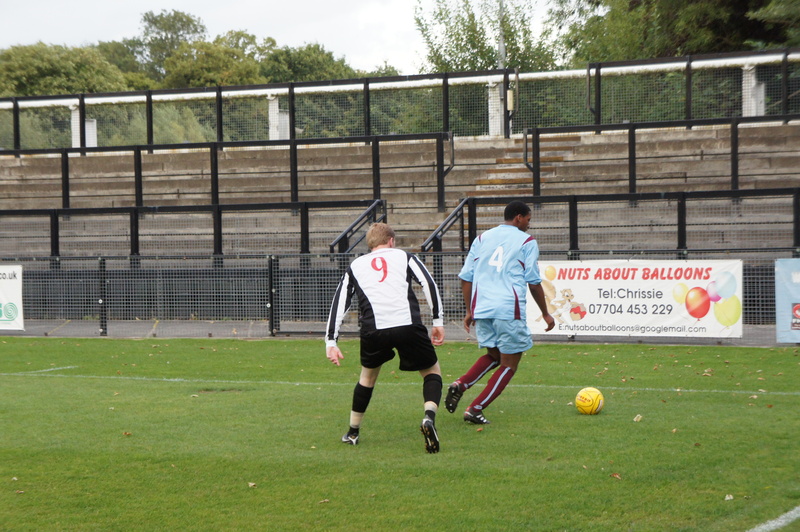 Unfortunately, the only game to survive was the various organisational mishaps was match against Tooting. Sadly, this kind of boobery has plagued Caribbean football in London of late thanks in no small part to the bungled efforts of several companies out to make a quick buck. First, there was a firm of agents known as Temptation Promotions. Disappointingly, there’s no connection with Motown, just a group of self-promoting likely lads who seem more interested in increasing their exposure than that of their clients. Probably why their roster is stagnating somewhat with the highest profile name currently on their books being Kettering forward and big fan of knives, Moses Ashikodi. It’s hardly IMG is it? To be honest, calling yourself Temptation Promotions isn’t really going to attract a Wayne Rooney (or even a Kwame Ampadu) to your front door. You’d be as well calling yourselves Caught Roasting Promotions. All of a sudden, a well-meaning but seemingly stop-start football school, the Solid Rock Academy, have emerged and are now is trying to get in on the Guyanese football cash cow. The company seems to share numerous traits of Temptation Promotions (including a mean cover of “My Girl”) so I’m naturally sceptical that the two entities may be effectively be the same animal…probably a reptile. Still, if you do fancy being either coached or represented by the Beebop and Rocksteady of the football world, give the guys a call. Sadly, despite the hype (from our end alone), there was no pomp and ceremony on show. No steel drums, no flags not even a rendition of Guyana’s national anthem. I felt mildly cheated. Park the bus. 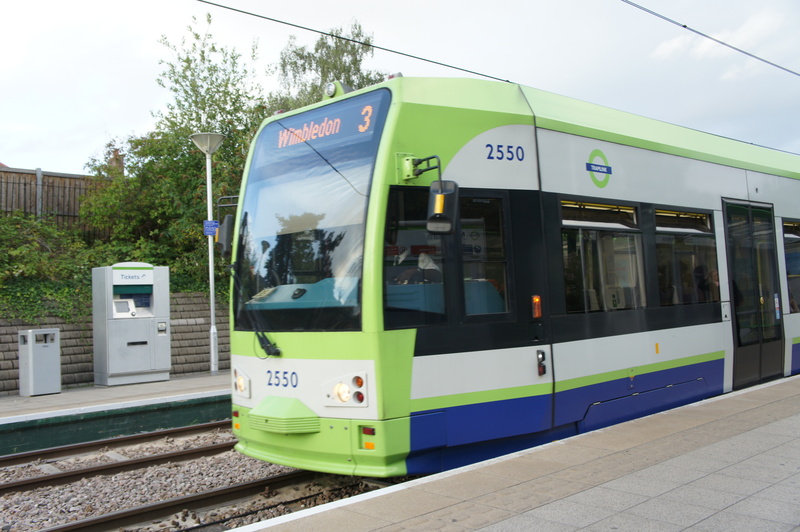 Mitcham tram stop is around 5 minute walk north of the stadium. 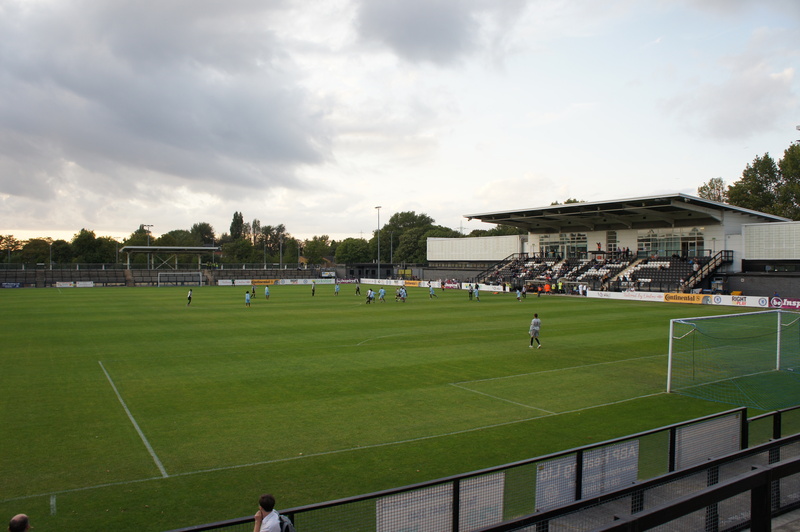 Those less keen on travelling like a Dutchman can go to Morden on the Northern Line (around 40 minutes from London Bridge) and take a pleasant 20 minute walk along the River Wandle to the stadium. Parking is free and there are usually Morden enough spaces. Sorry. Home Advantage. 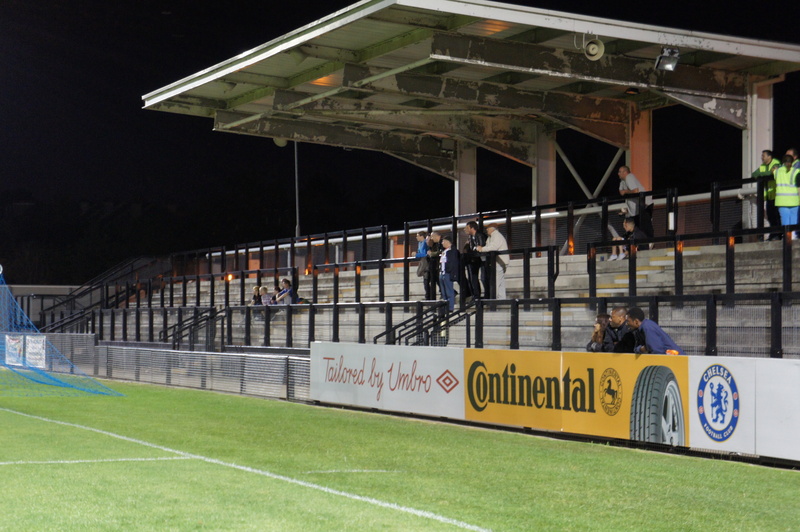 Imperial Fields (Dulwich code-name: Venereal Fields) has been home to The Terrors since 2002 when Tooting and Mitcham left their dilapidated Sandy Lane ground which failed its safety certificates and was deemed a fire hazard. 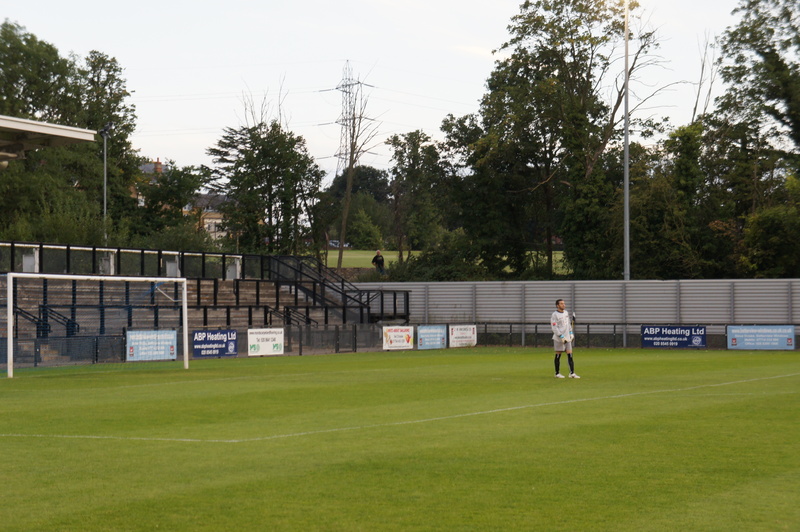 Happily, Imperial Fields was the replacement and much like the Hamlet’s own ‘new’ ground is has not merely endeavoured to ticking the FA’s Ground Regulation boxes, but also seeks to provide a decent spectator experience. The ground is a bit like a Bizarro World Champion Hill. It’s similar, yet all wrong. Like Champy, there’s a gym attached which offers good views of the pitch for those wanting to get hench and watch some football. 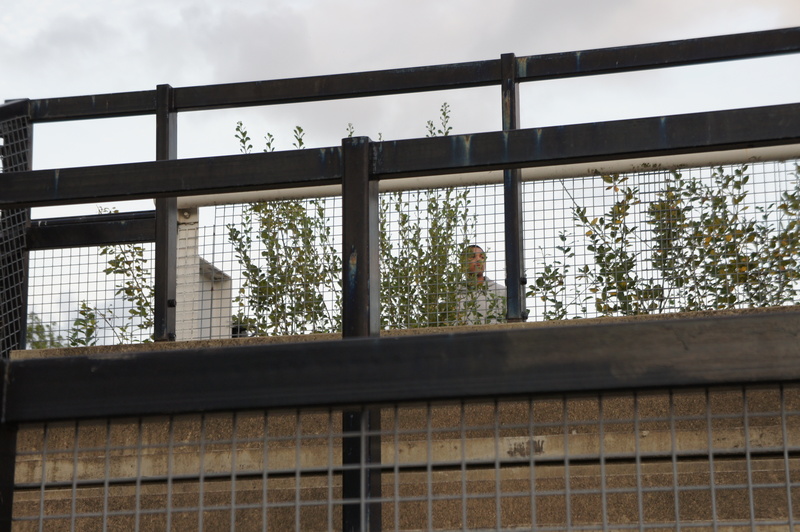 This was one of several free viewing opportunities the local natives seemed to take advantage of. 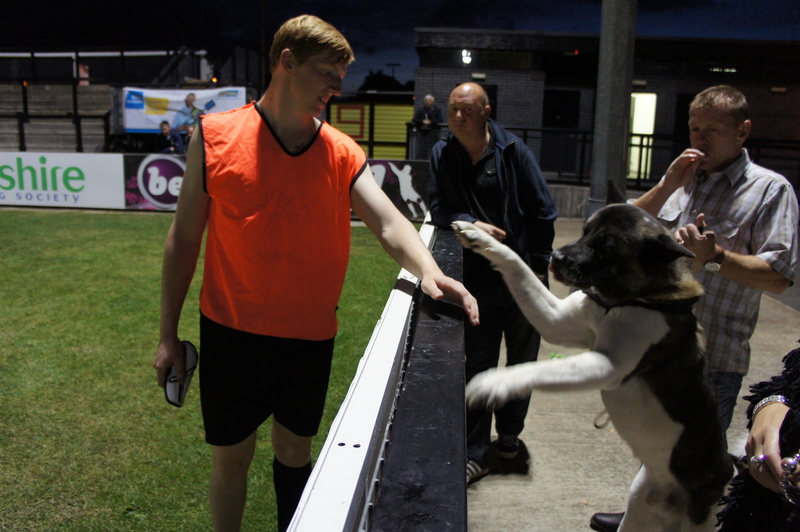 I’ve always found this football-equivalent of dogging to be rather demeaning, especially for non-league football. It’s like stealing from Oxfam. Imperial Fields has three stands and an uncovered area on the far byline. The covered terraces behind the goals are much larger than usually seen at this level and offered some excellent elevated views of the action rarely seen at this level, although their Brutalist Soviet style is quite overpowering. 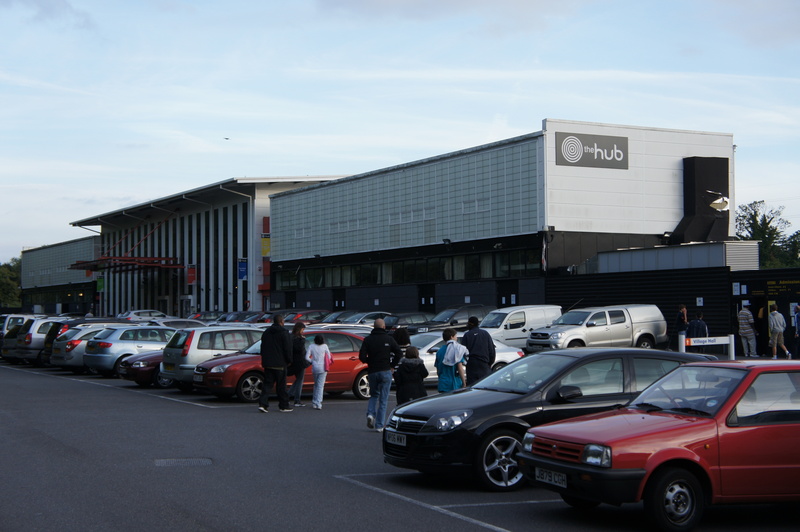 The main stand holds 600 seats and has a club shop and tea hut at the back. It’s pretty plush. Alas, the whole thing is let down slightly by preventing supporters from walking around the sand with the technical area blocked off by the Main Stand and an odd TV tower on the far side, blocking our circumnavigation. 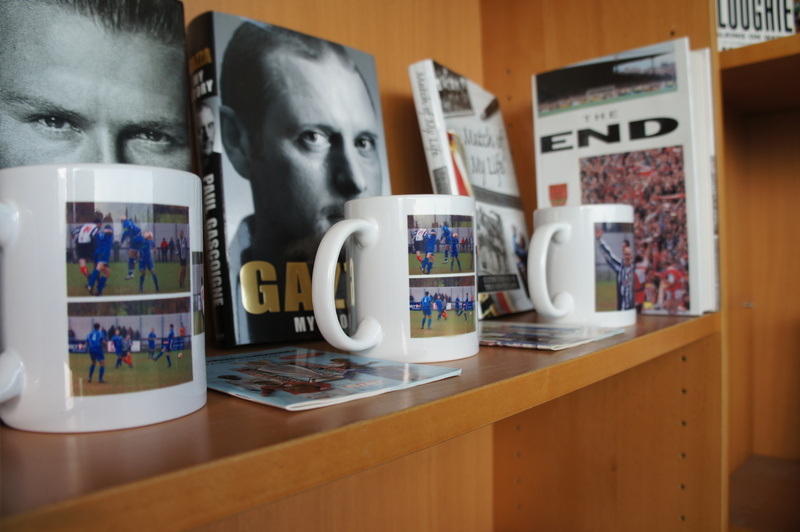 The club shop was well stocked with a full supply of Tooting oddities and a nice ranges of books and programmes. I managed to pick up a few Dulwich programmes including one from our last league meeting with Tooting, a fine 4-1 win in 2008, something the guy at the till didn’t seem to want reminding of. Prawn Sandwiches.Disappointingly, there was no nod to Tooting’s immense Curry Mile. Not even a Chicken Balti Pie. 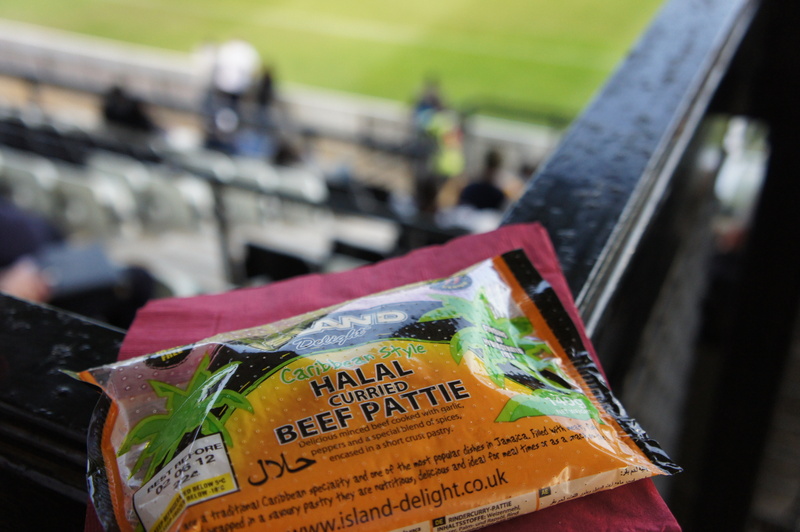 However, the addition of a Caribbean Beef Pattie was a fitting last minute addition to the tea hut’s repertoire. 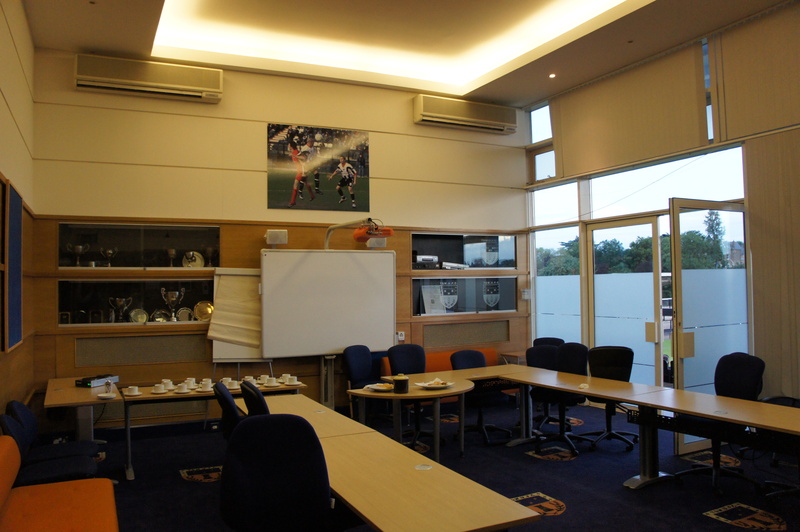 I was also lucky enough to get a quick tour of the hospitality suite thanks to the boardroom manager, Keith. In here, high-flying execs presumably indulge in a feast of cocaine and fine wines but as they were only setting up, all that was visible was a tray of fairy cakes and some cups of tea. I’m sure the rest was on the way. 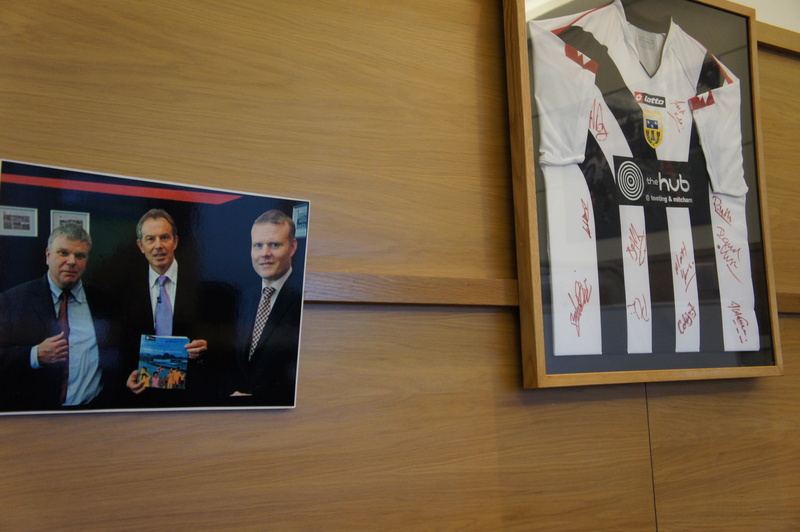 The boardroom was pretty nice with lots of pictures of years gone by as well as a puzzling pair of photos with former Prime Ministers Blair and Brown, who on seemingly separate occasions had both been conned into a visit to Imperial Fields. The Boardroom. Check the carpet! After this interlude, I rejoined the huddled masses and headed for the bar. Admittedly this was more of a primary school canteen with ale and not a patch on the Champion Hill bar (when it’s open) but the addition of the usual collection of flags and banners helped and frankly any club serving Hogs Back T.E.A on pump is not going to get a bad write-up from anyone at Pigeon Stands HQ. 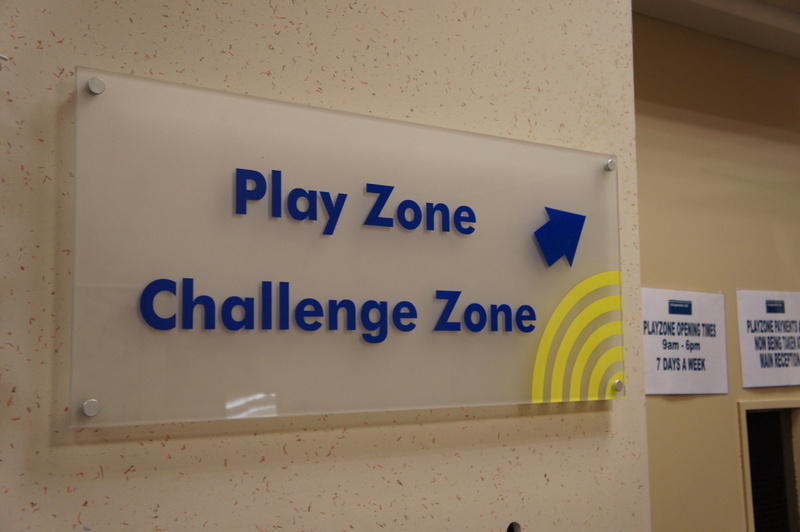 …and the game. Perhaps unsurprisingly in the circumstances, this was a rather one-sided affair with Guyana looking totally out of their depth. It became apparent after just 5 minutes when Billy Dunn was put through for the opener that this wasn’t exactly the team that (on ranking alone) should be giving Gareth Bale and co a good run for their money. Big Fola Onijube made it 2, rounding off some lovely build-up play and Jamie Byatt got the 3rd from the spot just before half-time. Former Hamlet centre-back (now an accomplished full-back) Osa Obanwonyi also had a fine half and seemed like a much more fluid footballer than the one that left Dulwich a year ago. The second half saw the pre-season tradition of multiple subs and the flow of the game was all but lost. The highlight was the excellent 4th by wonderfully named Freedon Pigott but a special mention goes to the Tooting sub, Jordan Anderson, who may just be the tallest man on the planet who fumbled the ball home from a corner to make it five. He makes Leatherhead’s (formerly Burgess Hill‘s) man-mountain Danny “Lurch” Gainsford look almost human. When Tooting face Leatherhead this season and these 2 beasts collide, time may very well stand still. As for Guyana, Golden Showers might be a more fitting nickname than the Golden Jaguars. I can safely say that not one of this side will get anywhere near an actual international match and most I suspect, couldn’t even get a deal in Step 5. Their goal in the dying seconds will be comfort to some but the fact they almost concede a sixth straight afterwards suggested that a famous comeback was unlikely. Man of the Match. This was a close call. The gigantic dog who seemed to be following me around was the real star of the show for me, even high-fiving Billy Dunn. That said, my visit to Imperial Fields stood out thanks to boardroom manager Keith, who stopped his work to insist that I come into the boardroom and have a tour. Whilst I could have coped without his anecdotes of previous Tooting glories over the Hamlet, I couldn’t hold it against him, especially as I’d done similar with in the club shop earlier. Thanks Keith! "Stand up if you hate Tooting". Silly thing didn't understand the chant. Bloody Dogs. Post-match rub-down. Obviously I came with my guard up for this one and desperately tried to find fault with anything I could. Disappointingly, I’m sad to announce that (prehaps unsurprisingly) Tooting was a solid evening out. OK, they’re Dulwich’s Skelator but ultimately they seem like a well supported, knowledgeable and reasonably pleasant bunch. 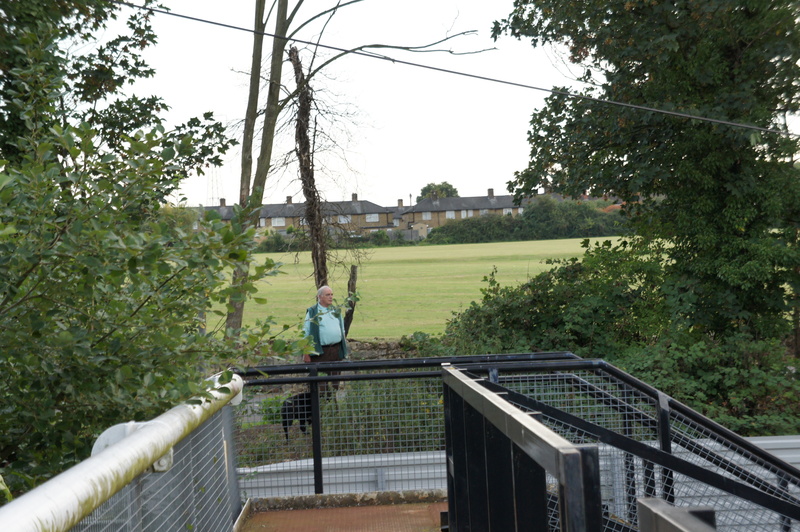 Their most loyal supporters may not be as witty and urbane as those at the Hamlet and certainly not a debonaire, but their chat wasn’t dinging either and on the field, Tooting and Mitcham play football in the right spirit. 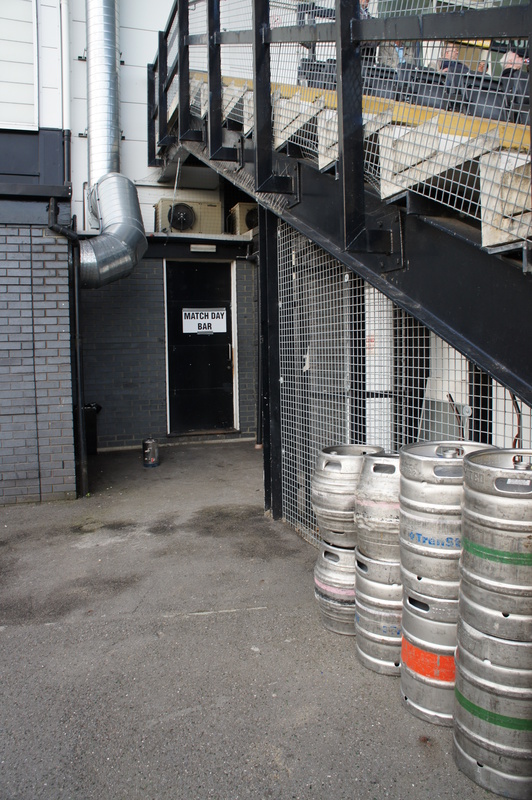 That said, apart from Jamie Byatt and Billy Dunn who I thought was exceptional, there wasn’t too much of a gap in quality between Tooting and the top of Step 4 and I suspect that might be a bit of a problem for them this season. If they do slip up (and the Hamlet miss out on promotion…unlikely, I know), I’ll be looking forward to coming back, albeit in my pink and blues. 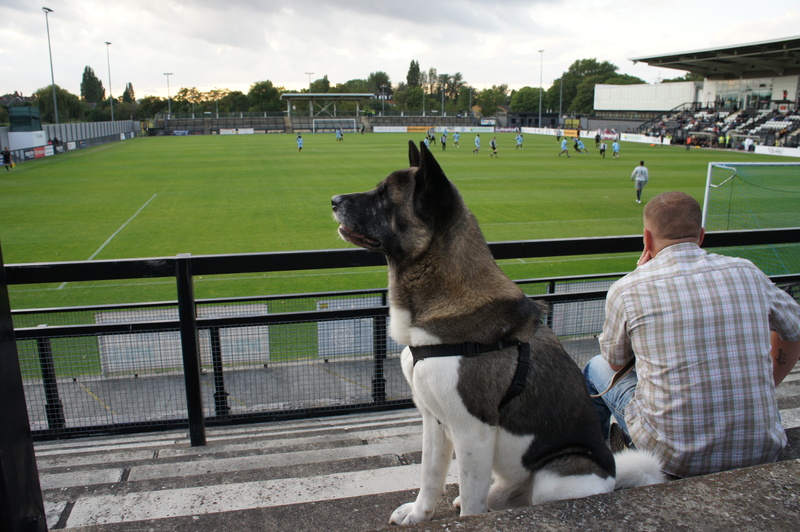 As Dulwich are still to lose a match at Imperial Fields, I dare say I won’t be the only one eyeing up a return visit.